We’re back to the Legion of Super-Heroes stories that hooked me in the 1980’s. With the story of the Legion of Super-Villains pretty much finished, we’re shifting our view over to the newsstand title, Tales of the Legion. To be honest, I wasn’t reading the Baxter title at the time this issue was published. I didn’t have easy access to a direct market comic shop. I bought all of my comics from the newsstand. It wouldn’t be until about a year later that I managed to snag a few copies at a nearby comic show at a shopping mall. A couple of years later, I would discover a direct market shop in that same nearby town. Dream Girl calls to order a meeting of all of the available members of the Legion. Cosmic Boy mentions that the table seems empty. With five Legionnaires missing and two out to care for a new child, the strength of the Legion is at an all-time low for most of the members. Dream Girl orders Brainiac 5 to try to augment Dawnstar’s tracking powers and Star Boy to call in the reservists. Cosmic Boy argues that they need more new members, but Star Boy responds that the students at the Legion Academy aren’t ready. Cosmic Boy resigns his argument with the question if any of the current Legionnaires would have passed if the founders had the same strict standards when first adding members to the Legion. On Talok VIII, Grev Mallor, Shadow Kid infiltrates a rebel camp on the hills outside the main city. His cousin is Shadow Lass of the Legion. In the command trailer, he witnesses a beautiful young woman in a ancient rite of ancestor worship. He tries to record her. Suddenly, the Persuader attacks him. The Persuader’s Atomic Axe can even slice through the darkness field Shadow Kid throws up in defense. This advantage makes it easy for the Persuader to knock the hero unconscious and take him prisoner for the young woman in the trailer, on their way to taking over the entire planet. At Legion HQ, Shadow Lass tells Mon-El that she’s not received any messages from her cousin. They convince Dream Girl to let them go to investigate, but they haave to go alone, she can’t spare any other Legionnaires. This infuriates Shadow Lass, but Mon-El assures her that there’s nothing that the two of them can’t handle on their own. On Talok VIII, the rebels are shelling the city. The Persuader and Lady Memory revel in their success and the capture of Shadow Kid. As the rebels attack the city in earnest, a huge wave of darkness reaches across the city. A trench opens up between the rebels and the city walls. Persuader recognizes the work of Legionnaires. Shadow Lass swoops in to confront him. Brainiac 5 is hooking up machinery needed to augment Dawnstar’s powers. He’s using Timber Wolf to carry heavy components needed for the attempts. Timber Wolf trips, toppling the immense equipment towards Brainy and Dawnstar. He flips and kicks the component into place perfectly. The rebels on Talok VIII train all of their guns on Mon-El with no effectiveness. He tosses them away and to the delight of the city’s mayor, viewing from afar, makes short work of a construction machine the rebels have conscripted for their attack. The Persuader’s Atomic Axe slices through Shadow Lass’s darkness, but she evades his swings at her. After placing shadows directly in his eyes, she goes to rescue her cousin. At Legion HQ, Brainiac 5’s first attempt to enhance Dawnstar’s tracking powers fails. On Talok VIII, Shadow Kid warns Shadow Lass that Lady Memory is a real threat. She is the last line of her line, wiped out by Shadow Lass’s ancestors. Mon-El interjects placing himself between the two young women. Lady Memory uses her power on Mon-El, bombarding him with his memories. The story is pretty straightforward, with some classic subplot development with Brainiac 5 trying to augment Dawnstar’s powers. The main story revisits Talok VIII, and emphasizes the legacy of the Fatal Five’s attempted takeover of that world. That first brought Shadow Lass in contact with the Legion. Shadow Lass has an emotional investment any time a member of the Fatal Five is involved. 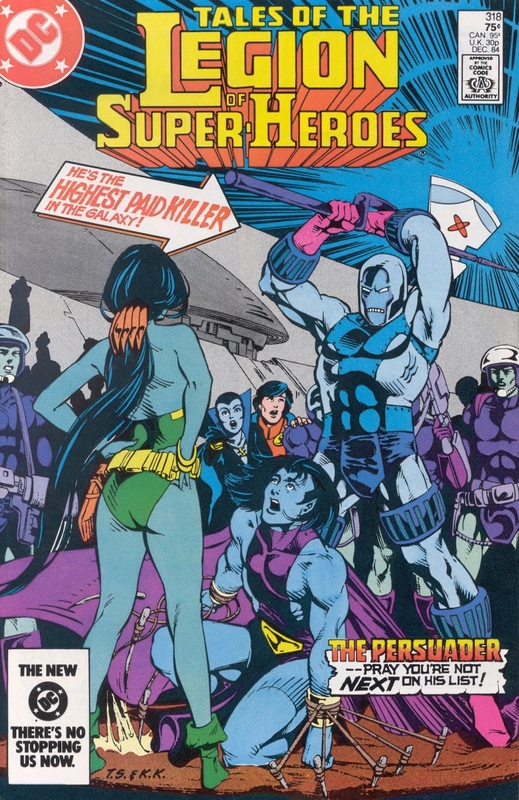 Writer Paul Levitz touches upon this when she faces off against the Persuader. However, Levitz prefers to put the real emotional impact behind the ancestral relationship with the new villain Lady Memory. Lady Memory never really took off as a Legion villain. Her primary connection is with Shadow Lass, so there’s no real reason for her to target anyone else, except perhaps Mon-El, which she does at the end of this issue. Talok VIII also has never appealed to me among Legion worlds. There’s a dichotomy between the citizens of the large city, apparently, the only one on the planet, and the people that roam the hills and almost desert-like wilderness. It does ring true of modern-day divisions in societies, but the standard of living on Talok VII seems crude, even in the city. No writer has effectively developed Talok VIII much. However, it remains the desert planet that Shadow Lass comes from. Terry Shoemaker’s artwork is very organic here but rings familiar to the recent artwork being done on the Legion titles. At the same time, he makes the Legionnaires seem to be very much in their late teens and early twenties. His Dream Girl is less of a vamp, and more of a normal young woman. Likewise, his Dawnstar seems approachable. Unfortunately, at this point, his men all share similar features, lacking enough distinction to be recognizable without coloring. This is early in his career, and those missing elements are something that he’s developed. Don’t get me wrong, the art is very good and very approachable. I overheard it mentioned in a recent episode of Legion of Substitute Podcasters that Shadow Kid appeared first. He’s one of the “heroes of many worlds” in Nardo’s prison camp. This was in Adventure Comics #344, almost two years before his cousin, Shadow Lass debuted. Although, we did see Shadow Woman’s statue in Adventure Comics #354. She was one of the Legionnaires fated to die according to that story. In Legion of Super-Heroes #300, that future was retconned to being an alternate future for the Legion, since she didn’t perish in the way her statue mentioned. I still find it interesting that Paul Levitz, the same writer that performed that bit of changing to Legion canon, also retconned the Shadow Kid seen back in Adventure Comics #244, and not even given lines, to being Shadow Lass’s younger cousin. This is one of the reasons he’s considered one of the best writers for the Legion. If you’re looking for the issue itself, then you should be able to find it with a little searching. Don’t pay more than a few dollars for it, as you can probably find a copy in bargain boxes. If you want to read it digitally, then you can find it on Comixology. DC hasn’t collected this issue yet. That’s a real shame.